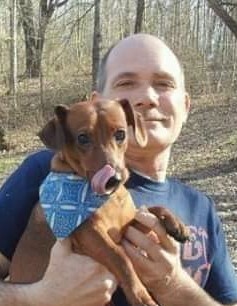 Jeffrey A. Smith Sr., 55, of Goshen, Indiana passed away on Sunday, March 17, 2019 at Goshen Hospital. He was born on February 8, 1964 in Sullivan, Indiana the son of Russell Smith and Wanda Railey Smith. Jeffrey worked at Graham Grain for several years. He is preceded in death by his parents and Michael Smith. Survivors include two sons; Jeffrey Smith of Linton, Indiana and Cody Smith of Goshen, Indiana, one daughter, Crystal Smith of Bowling Green, Kentucky, one step-daughter, Jessica Myers, three brothers; Brian Smith of Hymera, Indiana, David Smith of Hymera, Indiana and Ray Smith of Sullivan, Indiana, four sisters; Beth Smith of Hymera, Indiana, Nancy Smith of Terre Haute, Indiana, Cathy Smith of Dugger, Indiana and Kaylee Smith of Sullivan, Indiana and ten grandchildren; Avery, Jaxson, Carolyn, Sierra, Peyton, Hunter, Andrew, Gaby, Gavin and Beav. A memorial service will be held at a later date. Arrangements were entrusted to Brust Funeral Home.